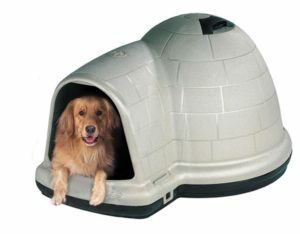 If you are looking for a new home for your dog, Petmate Indigo Igloo Dog House with Microban can be a great choice. Stylish and functional, these igloo dog houses can offer many benefits. 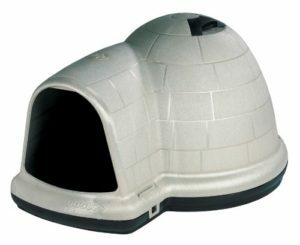 Petmate Indigo Dog House with Microban offers an igloo design, which is attractive for any style of yard. Its mild, natural color options and size choices match any outdoor décor and looks right at home in the winter. Dome-shaped top that repels water and snow. Circular shape that closely mimics the dens of wild dogs, making your dog feel right at home. Rounded floor edges to keep loose bedding dry and safely inside the doghouse. A flat floor that sits on any level surface such as a porch, deck, garage, or even inside the home. Extended doorways for maximize rain and wind protection. I love the versatility of this doghouse. 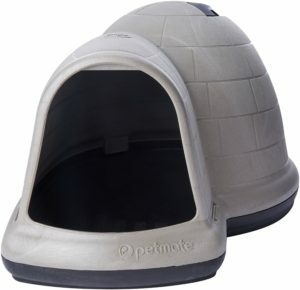 When I did the research, I found that many customers use Petmate’s doghouse for their cats as well. This really stuck a chord with me since I have both dogs and cats. The dog house is plenty big enough for all five of my indoor cats and would work just as well outside for any feral cats. Cats love to hide and these homes provide the perfect safe hideaways. The dome design of the Petmate Indigo Igloo Dog House makes both cats and dogs feel right at home and cocooned in their own safe and private area. Unlike most doghouses, the Petmate Indigo Igloo Dog House is made from structured foam. Structured foam is a type of insulated plastic that hardens to a very durable, but lightweight material. It is strong enough to handle even the most rambunctious dogs. The use of Microban, an antimicrobial, makes caring for the doghouse much easier. Prevents the growth of mold and mildew, which can be harmful to both people and pets. Makes the structured foam stain-resistant so cleaning is easy. Stops wet dog and accident odors in their tracks. Provides a lasting resistance to bacteria growth of all forms. The lightweight design is great. The doghouse can be easily moved from one location to another but still withstand most bad weather. Mud and pollen wash right off with a hose and a sponge. Unlike wooden dog houses, there are no shingles or boards to replace. 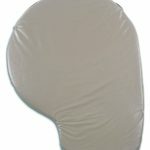 This aspect is a great asset for those who prefer to spend time with their dogs, instead of repairing their doghouses. Petmate Indigo Igloo Dog House comes in a variety of sizes from medium to extra-large. Instead of basing the sizes on the dog’s weight, you need to also check on the dog’s size. It is recommended for dogs that are no more than 26 inches in length and 17 inches tall. It is recommended for dogs that are no more than 36 inches in length and 24 inches tall. It is recommended for dogs that are no more than 42 inches in length and 31 inches tall. Each of the 3 sizes lists the suggested dog weight, but I would also measure the dog to be sure. Dogs vary not only in breeds but also sizes. A greyhound, for example, may weigh less than a pit bull. But since a greyhound will be taller, it will need a bigger house. Dogs need plenty of room in case they are nesters. Nesters will go around in circles several times before laying down. Make sure to give them plenty of room. The entrance to the Petmate Indigo Igloo Dog House is off-set. This keeps the wind, rain, and snow from blowing directly on them. It is similar to a wild dog’s den. Sizes vary, depending on the size of the dog house. To keep your dog from doing the army crawl, it is best to measure the dog. It would also be best to get a bigger size if you have a puppy. This will give him some growing room. 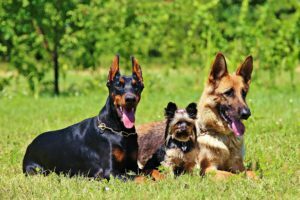 Dog sizes and breeds vary. From researching and reading customer reviews, I have found some helpful guidelines. Medium: Small breeds like Dachshunds and Pomeranians can fit with room to spare. I have heard that a medium-size Golden Retriever could fit in there as well. Large: Medium breeds like Huskies should have no problem with this size. Extra-Large: My research has shown this size works well for German Shepherds. I think most people run into size issues for one of two reasons. The dog is small enough for the interior but not the doorway. Or they pick a size for a puppy without making allowances for when he grows up. Best advice: measure the dog for both the doorway and the interior. The structure foam of the dog house keeps it cool in the summer and warm in the winter. Considered to be one of the most efficient insulation, it is nitrogen-based and environmentally safe. The Petmate Indigo Igloo Dog House has ventilation on the top which allows air to circulate, yet keep the rain out. The vent is adjustable so it can be closed in cold, winter months. Because the floor is not insulated, it might be wise during the winter to add loose bedding or a pad for greater insulation. Assembly is quick and easier. The dog house comes in two sections: top and bottom. These two sections snap easily together with plastic fasteners. This also makes cleaning a breeze. You don’t have to crawl into the dog house to change loose bedding or to wipe down. Simply remove the lightweight top, clean, and snap back together. This is much simpler than standard dog houses which can be difficult to clean. Frequent use can cause the fasteners to break. 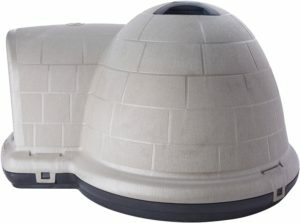 Petmate offers two different accessories for their Indigo dog houses. In my experience, you need to weigh your options. Both accessories might work well for smaller dogs, but not for others. The dog house pad will probably be fine if you don’t have a puppy or a nesting dog. Loose bedding will work just as well. The same can be said of the dog house doors. They do eventually wear out. Some dogs will chew them to bits. Another alternative is to put a heavy mat in front of the opening. Overall, Petmate Indigo Igloo Dog House rate very well. Sizing seems to cause some confusion. But this can be avoided if we go by size and not weight. The most complaints were about the accessories. Most dogs are rough on things. If you need to get padding, you can easily replace it with cedar shavings or straw. Door flaps wear out, no matter what it’s made from. A heavy mat will work just as well. You can read PetMate Indigo Igloo customer reviews here. When it comes to price, I think it’s fair for what you get. True, cheaper dog houses are out there. But in this case, you get what you pay for. The accessories, however, I would pass on. For me, if I can use something just as good for less, then that is the way I would go But then again, my dogs would make short work of both accessories. Lightweight materials make it easy to assemble and relocate. Microban makes clean-up and maintenance a breeze. 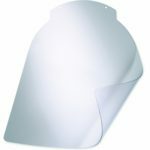 Petmate insulated pads and door flaps are sold separately. Sizing can be difficult. Choice of sizes greatly depends on the size of the dog, not its weight. Floor is not insulated. It require additional bedding or raising onto a platform. Accessories may not be worth the price. Better alternatives are loose bedding for the floor and a heavy mat for the doorway. After checking out the Petmate Indigo Igloo Dog House in person I was really impressed with the sturdiness of it. This would work great for our smaller dogs, especially in the harsh winters. I think it is well worth the investment. For bigger dogs, I am just not sure. The doorways are tight. Wider dogs would have difficulty squeezing in and out. I think a large dog crate would be better for big breeds like Saint Bernard or Great Pyrenees. Breeds like huskies, small pit bulls, and other medium-sized breeds would probably do well in the extra-large dog houses. Overall, I think it deserves the high rating and worth the money spent. Amazon.com puts a lot of effort into ensuring their prices are very competitive. Click below to see the current Petmate Indigo Igloo Dog House prices.